Walmart: New Pull-Ups Wipes For $.14! Huggies is phasing out its Clean Team product line and replacing it with new Pull-Ups products. 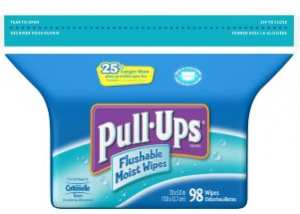 Walmart should have the new Pull-Ups Flushable Moist Wipes (42 ct packs) for just $1.64. These wipes will probably not be in the baby aisle but in the health & beauty section. There’s an aisle with the inexpensive baby wipes and bath products (they have the expensive stuff in the actual baby section) and adult wipes. The new Pull-Ups wipes should be in there. It may take awhile for all Walmarts to get this new product, so be patient. We have until the end of the year to use the coupons. If your family uses these types of wipes (we call them fanny wipes), this is a fantastic price and definitely worth stockpiling. If you need extra coupons, you can always get more off ebay or wait a bit. Huggies will certainly release more Sunday paper coupons and possibly a few internet printables. Leave a comment if you find these new wipes at your local Walmart!